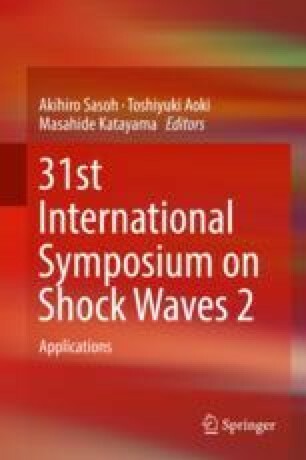 In this paper we present the amplification of shock pressure and attenuation of acoustic emission (AE) due to the impact of shock waves on multilayer E-glass armor materials having density of about 2000 kg/m3 with thickness of 5 mm and 10 mm. Shock tubes are well known to produce desired shock strength for material interaction. In this work the E-glass material is made to interact with strong shock wave produced from material shock tube (MST). The peak pressure amplification at the back wall is caused by the transfer of gas momentum to the material mass. The 5-mm- and 10-mm-thick E-glass material shows the amplification of 10 and 3 times, respectively, with respect to the incident front-wall pressure at different Mach numbers. The AE is generated by sonic boom at the open end of the diaphragmless shock tube (DST). A constant shock Mach number of 1.3 is produced in the DST to study the attenuation characteristic of E-glass material. The E-glass materials were placed at different distance from the open end of the shock tube at an angle of 30° at either side of the shock tube axis to study the attenuation of AE. The result shows attenuation of about 42–4% for 5 mm and about 85–52% for 10 mm E-glass materials. Financial supports from the projects of DRDO, ISRO, and STC-IISc of the Government of India are gratefully acknowledged. The author thanks Dr. Madhu V. and Mr. Jayarami Reddy from DMRL for providing E-glass material and Professor G. Jagadeesh from the Department of Aerospace Engineering, Indian Institute of Science, Bangalore, for his support and encouragement.